Do you think lobsters are ever jealous of clams? Clams get a real nice rap for their happiness level. It's something about their ability to hide out in their shell as the dangerous ocean roils around them. Well, lucky for you... and lobsters there's a way to be just as cosey as a clam without moving into a hard and slimy living space! Level the lobster up to the happiest animal in the sea with a fleece kigurumi that'll make you want to cuddle up as soon as you get home. And if you get invited to a Halloween party last minute, this will make a great costume in a pinch! 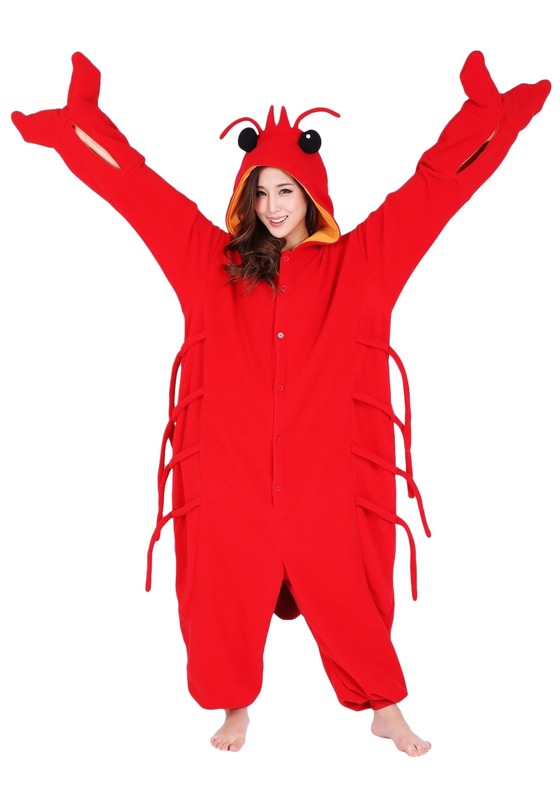 Whether you're a chef, a seafood lover, or just a little crabby, this cozy lobster suit is sure to stir up plenty of giggles and flavor to both your costume and lounging wardrobe. The fleece suit buttons up the front and has little crustacean legs on the sides. While the sleeves branch into hilarious lobster claws, you can also have access to your human hands with a slot in your sleeves. This look is pretty slick as there's a soft shell texture on the back for a 360 disguise. The whole look is completed with a yellow lined hood with an adorable lobster head on top. Oversized enough to wear layers underneath for cold weather parties and soft enough to lounge in after a day of feasting, there's always a reason to wear this lobster kigurumi. Decision making can be tricky when you're deciding on what cozy kigurumi to buy. Shake things up with a hilarious lobster costume that's party ready as soon as it arrives at your door. You don't even have to add butter anyone up to make this a real show stopper!